Molecular pump-probe spectroscopy benefits by extending the photon energy for probing to shorter wavelength into the extreme ultraviolet (EUV) . As the molecule undergoes complex processes like internal conversion or intersystem crossing, visible and ultraviolet photon energies can quickly lose their sensitivity to the molecular dynamics, not so the higher photon energies in the EUV. We generate the vacuum ultraviolet light via a process called high harmonic generation (link) . 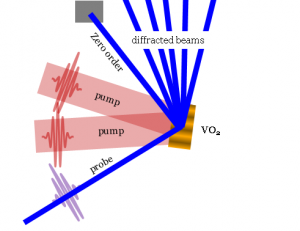 First experimental results show that EUV probing leads to a clearer picture of molecular processes as compared to multi-photon probing . 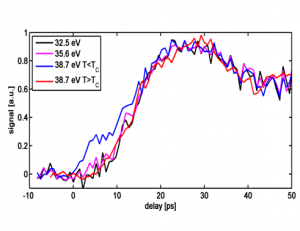 Short EUV light pulses provide a unique opportunity to probe the dynamics in systems containing 3d transition metals. Those elements show characteristic absorption edges (M-edges) due to inner shell to valence transitions. We have performed first experiments on the insulator-to-metal transition (IMT) system vanadium dioxide (VO2<\sub>) and identified the marker for the optically triggered phase transition in the EUV transient grating spectrum [3,4]. The figure on the left above shows a scheme of the experimental setup. Two 800 nm pump-pulses create a transient grating of optically pumped zones of the VO2. A third, time-delayed, probe pulse containing all photon energies in the range from 20 to 40 eV scatters of this grating. The scattering signal as a function of delay (right hand side) generally shows a long rise at photon energies below 39 eV. At 39 eV however, the rise is much shorter if the material is initially in the insulating state (blue line in figure on right). This is the trace of the IMT in VO2<\sub>, since the fast response is missing for metallic (warm) samples (see red line).